Chat is the main medium for communication between players. It is available in the lobby, as well as in battles. 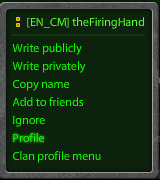 There is also a Clan chat available to players, who are part of an in-game clan. The chat has many uses, such as finding new friends, discussing the game, asking questions, coordinating with teammates, and many more. Players are free to talk about anything as much as they want, as long as the conversations do not violate chat rules. The game has a team of specially trained volunteer players called Chat Moderators, who answer players' questions, give advice and make sure the chat is always in order. After completing the registration, you can't see the main chat or use the game chat until you reach the rank Master Sergeant. Also, if you are a lower rank than Gefreiter, you'll be given a guide in the main chat of how to play Tanki Online. There are two chats in Tanki Online: the lobby chat and the battle chat. The first one (the lobby chat) consists of multiple channels and is available on the left side of the screen while a player is looking through the battle list or the garage. Messages sent in it are visible to all players that are viewing that chat channel at the moment. Note: Nicknames of banned players in chats will be shown as regular text, without any highlighting. The battle chat is accessible during battles. It is activated by pressing Enter, and is visible in the lower left corner of the screen. Sent messages will be visible to everyone in the battle. In the case of team battles (TDM, CTF, CP), the player has the option of either sending a message visible to everyone, or sending a message visible only to his/her team. To switch between these two modes press Tab while the chat window is open. By selecting a player's name you can send him / her a Private Message which will be visible only to you and to the other player. You don’t need to be on the same server to exchange private messages as the system works across the entire cluster. The only requirement is that you and the person you are talking to are both online. spreading content that is of an explicitly sexual nature, or that is otherwise not suitable for minors (remember, there are children playing here as well). How do I send a message to my team members only? Press Enter to open a chat window. Then press Tab to switch between general messages and messages that are sent to your team only. The color of the chat entry window should become the color of your team. How can I add players to my blocklist or remove them from it? /vote NICKNAME — reporting a player (works only in battle chat). Note: Your blocklist is stored in your cache, so if you clear your cache or use another computer, your blocklist will be reset. #nick — Goes to How to change your nickname. Click on the name of the person you want to report. Indicates that this is a Community Manager. Indicates that this player is a Chat Administrator. Indicates that this player is a Chat Moderator. Indicates that this player is a Candidate Chat Moderator. Indicates that this player is a Battle Moderators Administrator. Indicates that this player is a Battle Moderator. Indicates that this player is a Battle Moderators Candidate. Indicates that this player is an Events Administrator. Indicates that this player is an Events Organizer. Indicates that this player is an Event Helper. The Anti-flood System is an automated system designed to stop and limit spamming and flooding in the lobby and battle chat. The Anti-flood System works by restricting the number of characters over time. The restriction may not necessarily apply to the whole message, but even to a part of it. If you’ve used up your quota of characters for a set period of time, the extra ones will be highlighted in red, and instead of the “Send” button, you will see a timer telling you how long you have to wait before sending a message of such length. You can simply make the text shorter and send it, or wait till the time restriction is removed. Of course, if you’re well behaved in chat, the anti-flood system will not affect you in the least, except for the fact that you will see less flooding in the chat stream. If the same person has received many five minute bans regarding flooding and spamming, the server may put a stop by issuing an hour ban. This final ban had a time limit of one day; but due to false-positive errors, it was changed to the hour ban we know today. One of the most lodged complaints regarding chat moderators are due to the inability of the user to distinguish between bans issued from the Anti-flood System and a ban issued by a moderator. One of the key difference is that the automated ban system only issues a warning, a five minute ban or an hour ban; all regarding flood. These warnings and ban statements neither have a signature nor a direct hyperlink to the Rules page. On the other hand, moderators can also issue warnings and bans of the same time period. These usually contain a customized statement or a personal signature with a hyperlink to the Rules page. Moreover, it is easy to spot an automated warning/ban as it is issued almost immediately after a person floods in the chat. This is unlike a moderator-issued warning/ban, as it takes some time to issue them after a certain rule has been broken. Examples of automated bans have already been mentioned above. This page was last modified on 10 April 2019, at 14:12. This page has been accessed 92,300 times.